This book is about a 12 year old boy named Teddy whose parents both work at a zoo called FunJungle. He spends his days causing trouble all around the zoo until something happens. 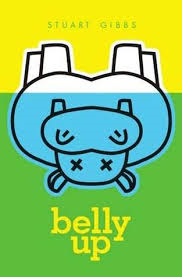 The zoo mascot, a hippo, goes belly up and dies for no apparent reason. Teddy then realizes that he's got a murder on his hands. With the help of Summer McCraken, the two find out whose responsible for this terrible death. The deeper Teddy and Summer get, the more they realize that the truth cannot be kept in a cage. Teddy likes to cause trouble anywhere he goes. When he finds out that one of the zoo's greatest animal dies he has to figure out why. He later meets up with a girl, and together they try to solve the mystery of the hippo. They look for clues, people or anything that could help them find out whose responsible for the murder. Teddy can cause trouble, but when it matters, he can be pretty helpful. I like this book because it provides for great entertainment and could teach some good life lessons. This book is filled with action and is a really great book to read.